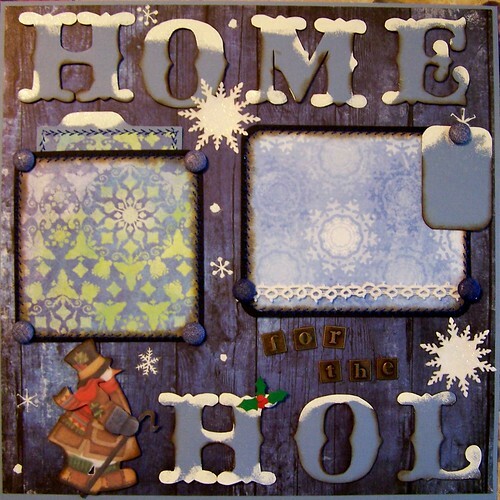 This is the second page for Home for the Holidays completing a two page spread. The lettering for Holiday continues on from page one to page two filling in the page nicely. Typically the same paper is used to wallpaper both pages. The snowflakes we make using a snowflake punch. 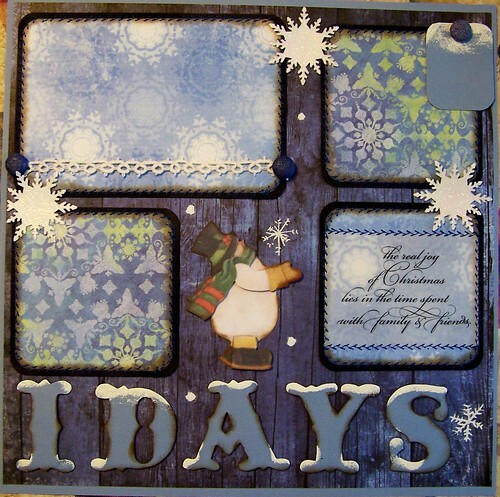 With the dark colors on this page the light color of the snowflakes brings the page to life. This photo was taken on September 15, 2007 using a Kodak DX6490 Zoom. Here is page one of a two page spread. This is a great page to display pictures of your children playing in the snow or just having winter fun in general. The colors of the tags, lettering, mats and wallpaper all blend together nicely and would work great with any winter pictures. This photo was taken on September 15, 2007 using a Kodiak DX6490 Zoom.